Recognize the signs. Rip currents are a common danger at beaches: Each year, 100 Americans drown in the fast-moving channels of water that can pull swimmers and waders away from the shore. Though hard to detect, rips aren’t invisible: Look for gaps in the lip of the waves or for trails of muddy or foamy water flowing outward. A rip current is created by excess water that gets trapped on shore and is seeking a way out. Check for flags. Lifeguards use flags to indicate water conditions. A yellow flag means rip currents are present, and a red flag means they’re strong. If you see double red flags, stay out of the water. Rip-current advisories are posted by weather.gov. Don’t fight the power. Swimming directly against the force of a rip current is a losing battle, even for a strong swimmer. Instead, swim parallel to the shoreline to escape the current, then head toward shore. It’s almost impossible to juggle a hotdog, a beer, and a pair of binoculars while sitting in the nosebleeds at a sporting event. Enter Sportnoculars. 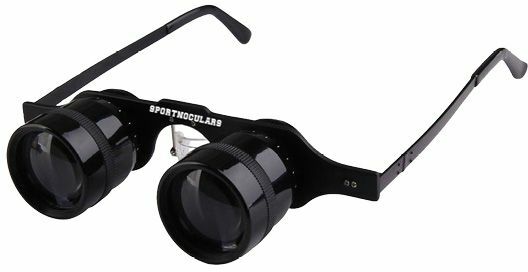 That’s right—someone has finally grafted a pair of binoculars onto eyeglass frames, and long-distance sports or concert spectating may never be the same. We haven’t tested a pair, but we assume the lenses get a little heavy on the nose—and they look like the wearer’s eyes have been somehow weaponized. But these specialty specs magnify objects by up to three times and come with several adjustable fitting features. They’re even billed as being able to fit over regular eyeglasses.